Social media management was never been easier. It needs a lot of time to interact with your customers by updating your account on a daily basis and posting engaging contents. It ate many hours in your work which should’ve allocated for other important works. Even if you planned to update the page or business group in the social medias, other busy works interrupt you in the middle. So, here we found a solution for all these irritating problems. $99 Social is a social media management company that effectively keep care of your social media accounts. It can manage almost any popular social media networks including Facebook, Google+, Twitter, etc. effectively and efficiently. As the name itself suggests, the plans are starting from $99 which may vary according to further requirements. Knowing this, many social media marketing companies came into existence but the bitter truth is that most of them didn’t output the desired results. And most of the times, they fail to provide what they offered before signing the deal. So, choosing the right and trustworthy social media agency is a crucial factor that indirectly affect your growth and reputation. But most of the timers, businessmen or entrepreneurs fail to find such a one. But, the $99 Social is a bit different in the business, so that we decided to have a thorough review of the service. In this review, we will provide the most noticeable features of the service as well as our final verdict on it which will be your key in making a decision. So, let’s have a look. 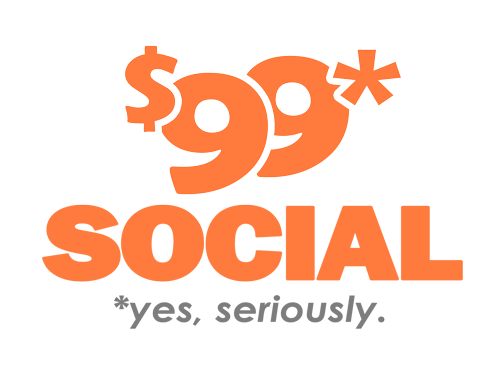 As mentioned before, $99 Social is a social media management company that founded in 2011. It has grown huge in the past years and service thousands of happy customers throughout the journey. They simply take away your stress on the social media by posting quality content on a daily basis which is customizable as per your requirements. They select unique content and catchy pictures for each and every post and post them with the popular and eye-catching hashtags. So that the post will reach to its maximum potential reach. The support is available in an email, phone, and chat. Users could select the best method to keep touch with the company. The $99/month pricing looks a little better than other companies of its kind and is considerable even for the small business owners. $99 Social offers almost all services required to keep in touch with your customers actually. They post unique content on a daily basis with the support of good images and hashtags; they optimize your social media account for better reach and search engine visibility; they help to remove any spam or malicious activities in your social media accounts, and even help to promote your newly launched product or services. These are enough to be top of the industry by getting thousands of customers from a single business social media accounts. The services will range from Facebook, Google+, and Twitter to further networks after getting a deal. There is a simple three step procedure for the service. Sign up from their website by providing the essential information regarding your business. Then, have a discussion with them and let them know more about your business and your requirements. And finally, sit back on the chair and watch what they do on your social media accounts. The social media posting and other optimization services will start within 2-4 days after giving them the access to your account. As already mentioned above, it costs $99/month for daily postings to your Facebook and Twitter pages, 365 days per year. Need more social media services? Check out their more comprehensive social media plans to boost more sales to your business. There are no additional cost or payments needed as long as you can afford this money. If you need further support and need additional help, you can always contact them and have a discussion on the matter. Alternatively, watch this video get a better visualized idea about the $99 Social. What users saying about the service? Here are some customer reviews taken from their website which may be helpful to you to understand what users experienced from their service. $99 Dollar Social is a considerable social media management company which offers numerous services for maintaining social media accounts. With the optimization services and social media marketing, the company serving thousands of small business owners all over the globe. From our experience also, they did a good job even though not the best. But when comparing with the pricing of their service, it is explainable. If you own a small or medium scale business and not have enough time to take care of the social media accounts, go and give a try to the $99 social. It is a good service where you can spend some of your hard-earned money. For more customizable social media plans please check their website.